Though he left the country more than 20 years ago, returning home to his native Ukraine is always a special occasion for pianist/composer Vadim Neselovskyi. His summer 2014 performance at the country's largest jazz festival, Alfa Jazz, took on an added poignancy, however, because of the political turmoil afflicting the nation. 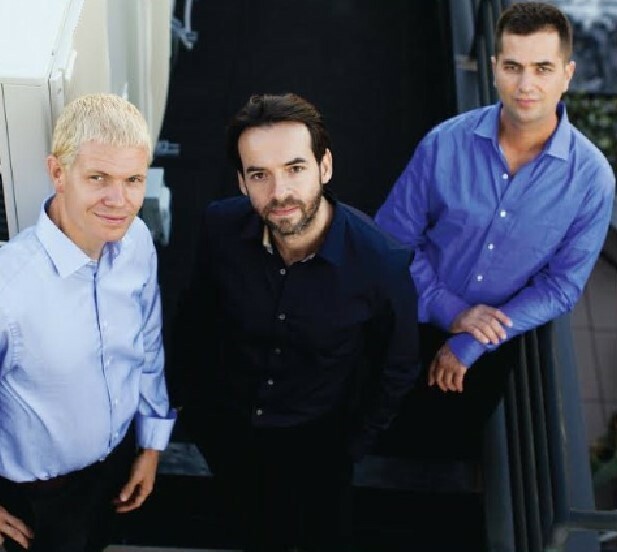 Having assembled a trio especially for the occasion, Neselovskyi forged a strong and meaningful bond with his bandmates - bassist Daniel Loomis and drummer Ronen Itzik - through this act of musical communion with his homeland. 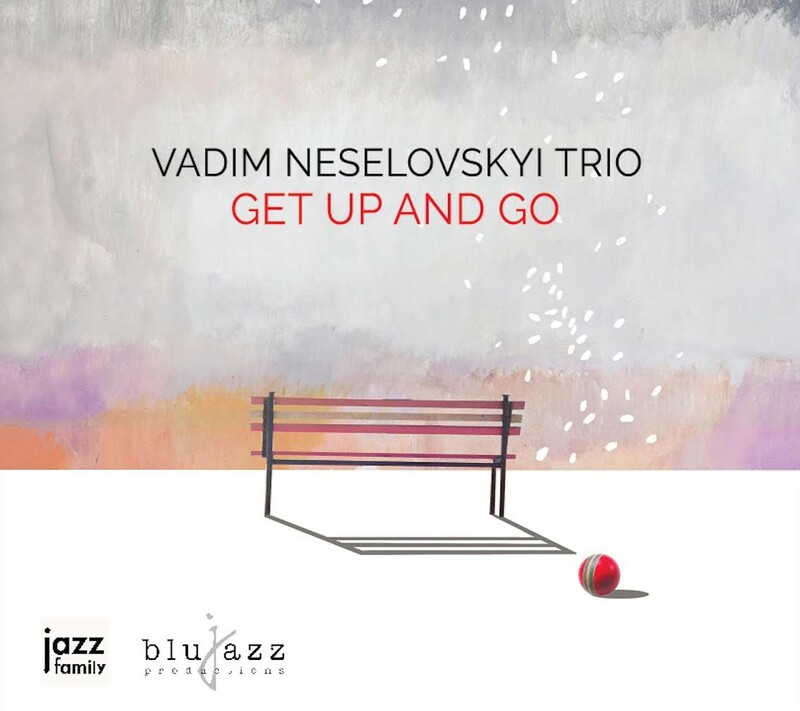 That deeply emotional bond can be felt and heard throughout Get Up and Go, Neselovskyi's first trio recording. The album, due out May 19, 2017 via Jazz Family and Neuklang Records, shows off the range of emotions this trio is able to summon, as well shining a spotlight on Neselovskyi's compositional gifts, allowing him to conjure a remarkable symphonic sweep from such limited instrumentation. Changing the program on the fly, Neselovskyi opened the set with a solo performance of "Krai," a poignant piece that quotes from an Orthodox prayer, the raw feeling of which he replicates here. The trio followed with "Get Up and Go," the piece that became the new album's title track. Though the phrase connotes a feeling of energy and ambition in English, Neselovskyi was unaware of the idiom when he originally composed it (the song was originally recorded on Gary Burton's Next Generation album). In the composer's mind, the phrase refers to a soldier, wounded on the battlefield and lying on the ground, who wills him or herself to rise and carry on. The tune's air of quiet but forceful resilience proved especially resonant in the circumstances in which the artists and audience alike found themselves that tense summer day. "The human soul is a complicated thing, and we'll probably never understand how it works, but I can say that I have a special connection to the place where I was born," Neselovskyi says. "Every time that I visit Ukraine or Russia, I think I'm subconsciously searching for this feeling of home that I had when I was growing up, but it cannot come back. That concert was a moment when I felt that I was together with my people, as strongly together as maybe only tragedy can bring people." It was also a spontaneous shift in plans of which only a smaller ensemble would have been capable. Given his taste for employing an orchestral palette in his work, Neselovskyi had long resisted leading a trio. "I think of myself primarily as a composer, and I always felt like my music naturally required all these extra layers that a piano trio could not give," he explains. Having gleaned a wide-ranging grasp of orchestration from working in both orchestral writing and extensive solo performances in the wake of his solo album Music for September, Neselovskyi began to change his thinking, coming completely around upon discovering his significant chemistry with Loomis and Itzik. "Suddenly I started to see possibilities for how a trio could sound like an orchestra." Not all of the music on Get Up and Go echoes the mournful mood of the Alfa Jazz performance. The album begins in the sort of playful mood that the trio originally had in mind that day, with the joyfully spiraling "On a Bicycle," inspired by 20th-century Russian poet Yevgeny Yevtushenko. "San Felio" evokes even sunnier climes, sparked by a vacation on the Mediterranean and capturing the image of sunlight reflecting on the sea as well as the sheer freedom and exuberance of getting away from it all. The muted, hauntingly slow "Winter," highlighted by Loomis' wrenching arco bass, depicts the isolation and detachment embodied by the coldest months of the year, while the dreamy "Station Taiga," featuring ethereal wordless vocals by Portugese singer Sara Serpa, gives that mood a geographical location - the train station that marks the entryway to the "infinite forest," the seemingly endless, snow-covered forest that covers much of Siberia, Canada and Alaska. "Who Is It?" picks up the pace again, with frenetic, buoyant rhythms inspired by the folk music of Moldova and the Balkans that Neseolvskyi heard as a child. "Prelude for Vibes" adapts the title track of Next Generation, written with Gary Burton in mind, into a piano trio version, while interludes featuring a Loomis solo and an atmospheric group improvisation both culminate in the album's moody closer, "Almost December," the delicate, first-snowfall stillness of which is hypnotically enhanced by another appearance by Serpa. 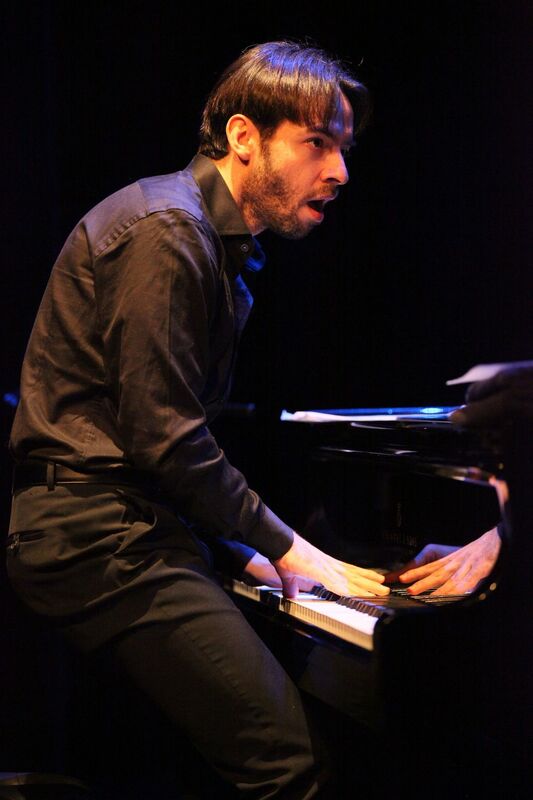 Neselovskyi's 2013 solo piano album Music for September was produced by Fred Hersch and received wide critical praise including a 4-star review in DownBeat. He has worked closely with another mentor, Gary Burton, for the past twelve years, both performing with and composing for the master vibraphonist. His next release will be a duo recording with French horn player Arkady Shilkloper celebrating five years of collaboration, and he has plans for an album of his orchestral compositions in the near future. 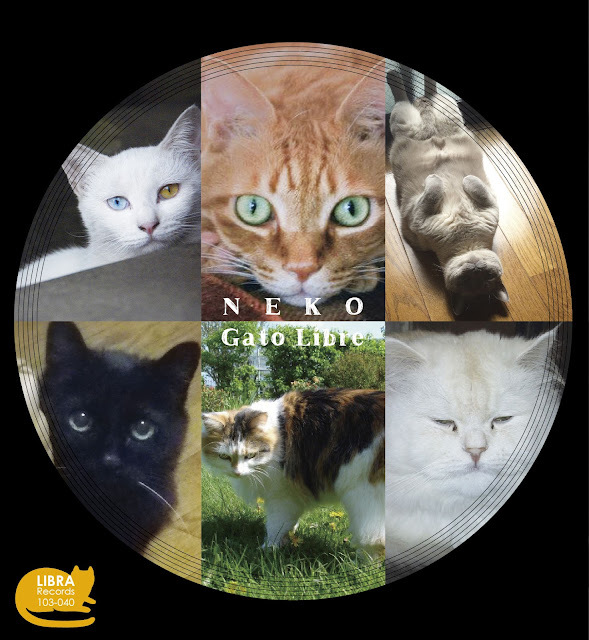 On their seventh album, Neko (available June 16, 2017 on Libra Records), trumpeter-composer Natsuki Tamura’s Gato Libre triumphs over adversity to produce what is perhaps their most radical and powerful album yet. 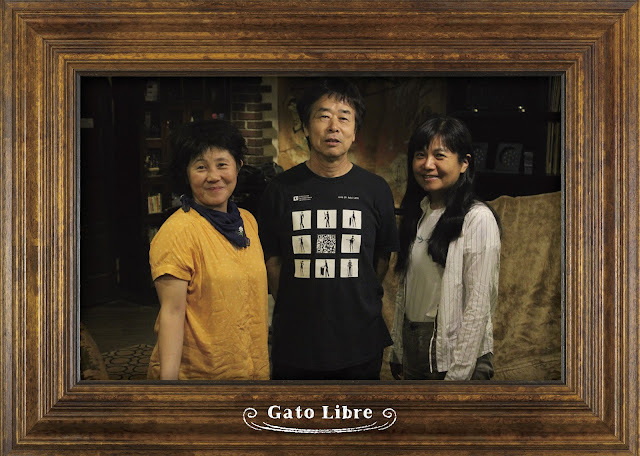 With the recent death of their guitarist Kazuhiko Tsumura, Gato Libre carries on as a trio featuring Satoko Fujii on accordion and Yasuko Kaneko on trombone. Paring away the references to ethnic folk melodies and dance rhythms heard on previous albums, Gato Libre’s latest incarnation transcends genre boundaries and soars into a realm of austere, beautiful, and majestic sadness that hardly any music—regardless of genre—ever touches. And so Gato Libre once again rises from the ashes of sorrow for their seventh album, which will also be available in a limited edition LP, as well as CD. Haunted by the spirits of its members who have passed, the recording signals a new, adventurous direction for the group. 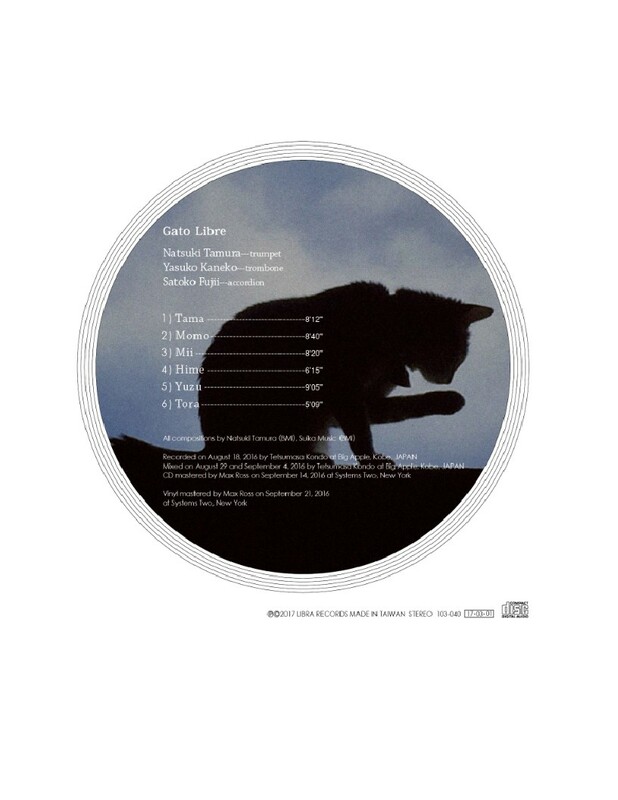 Shedding stylistic and ethnic-music references—such as the tango or Eastern European or Japanese folk musics of previous releases—Gato Libre nevertheless retains folk music’s elemental power to convey feeling simply and directly while using modern extended techniques, collective improvisation, and jazz soloing. “Tama” showcases the careful blending together of voices in perfect balance. Instruments come in and out of the ensemble to play the wistful melody or solo over a soft drone played by one or more of the other band members. When they play a melody together, as they do on “Momo” and “Yuzo,” there’s a soaring, mystical quality to the music. Tamura has never sounded so vulnerable and tender as he does during his solo on “Momo.” And he plays with impish humor on “Hime,” making muttering duck sounds against Fujii’s solemn, church-organ chords, in a performance that encompasses both absurdity and sadness. In keeping Gato Libre alive, Tamura has refined his vision of the band and given it new depth and power. 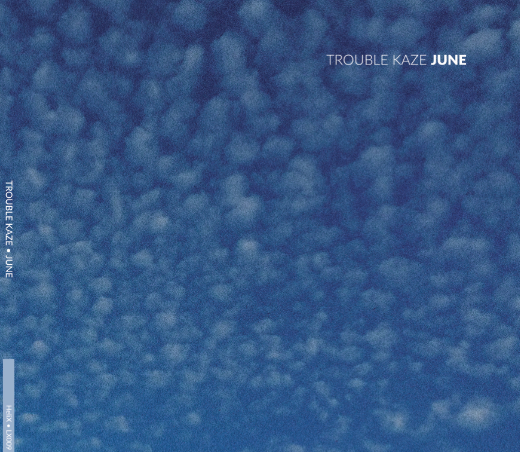 June introduces Trouble Kaze, the moniker chosen for the newly reshaped combo which adds a second pianist and drummer to the original line-up. 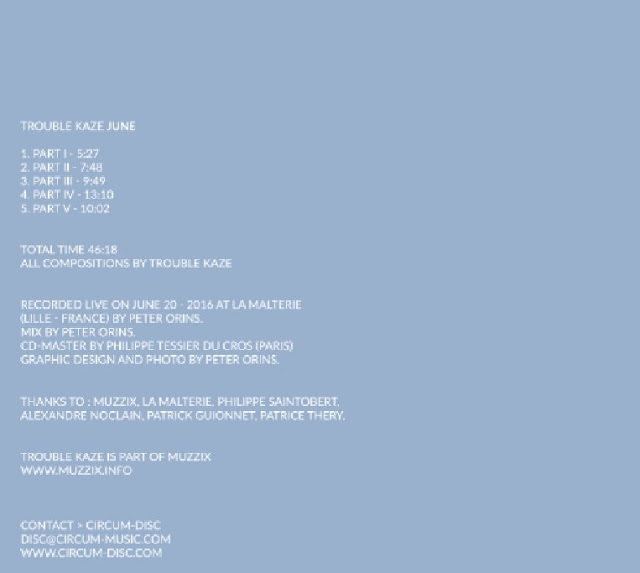 "The band can be conceived either as a triple duo or a double trio, hence trouble," explains Peter Orins, who suggested the formation of both Kaze and Trouble Kaze. "Moreover, the word also underlines the ambiguity of the situation." The title of the album comes from the fact that the band was caught on June 20, 2016, which signaled the end of spring, the longest day of the year, and the summer solstice. While the music is deeply steeped in abstraction, the musicians know when to inject a touch of humor or let their emotions run free. The second part ends with a slow crescendo while the third one concludes in a joyous chaos. The band make extensive use of extended techniques-a term that describes unconventional use of an instrument-including Pruvost's signature of a plastic tube to blow in his trumpet, with Orins and Lasserre in the roles of percussionists rather than drummers. Agnel and Lasserre perfectly blend with the other members of the band. "Very quickly, Christian and I thought about Sophie and Didier because we've known them and played with them for years," Orins says. "To get Sophie and Satoko to play together was very dear to me as well." The recording will be released on March 3, 2017 via Circum-Disc's HeliX collection (LX009). 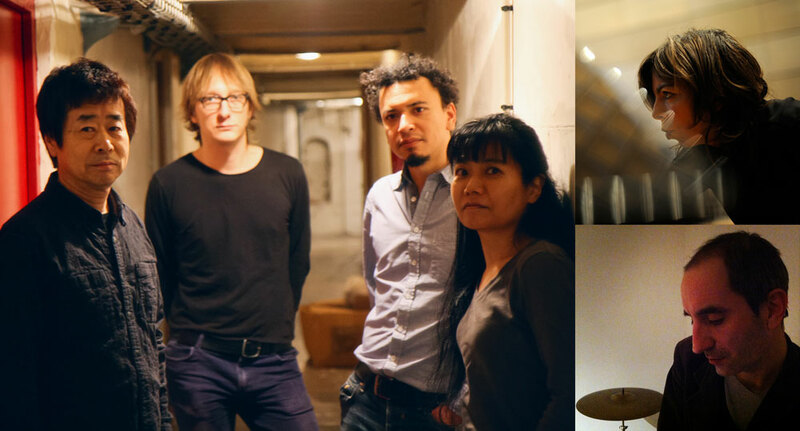 Fujii and Tamura originally met Orins in 2002 when the pianist's quartet shared a bill with the drummer's collective Impression in his hometown of Lille, France. Nearly a decade later they crossed paths again and Orins suggested a collaboration with Pruvost, inaugurating Kaze as a quartet with unusual instrumentation. 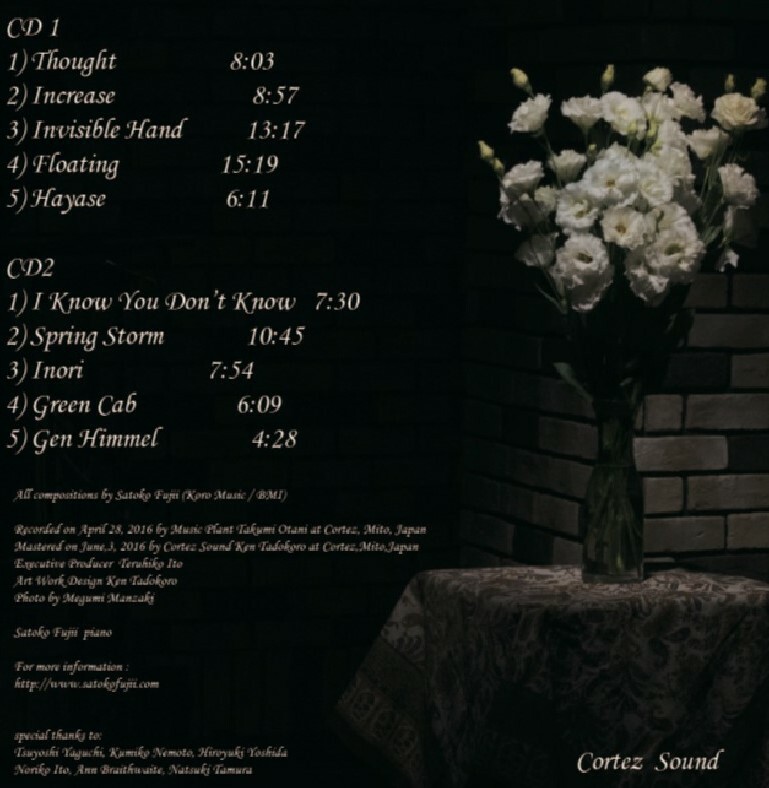 As a quartet Kaze has released three acclaimed recordings: 2011's Rafale which earned a place on numerous best of the year lists as "a stunning achievement from note one" (NYC Jazz Record), 2013's "highly original" Tornado, and 2015's Uminari which the London Jazz News called "...bold, uncompromising music." From 2013 - late 2016, Satoko Fujii and husband Natsuki Tamura split their time between Tokyo and Berlin. During that time, they deepened their musical relationship with Orins and Pruvost who have now become their closest collaborators. 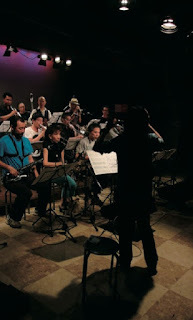 The two Frenchmen were even invited to join Fujii's Orchestra Tokyo on their latest recording, Peace (Libra). Trouble Kaze also illustrates Satoko Fujii's desire to expand her horizons and develop new musical partnerships as witnessed recently with the debut album of her Orchestra Berlin (Ichigo Ichie, Libra) or a duo recording with bass player Joe Fonda (Duet, Long Song Records). Orins and Pruvost are the pillars of Muzzix, a collective based in Lille and comprised of about 30 musicians. 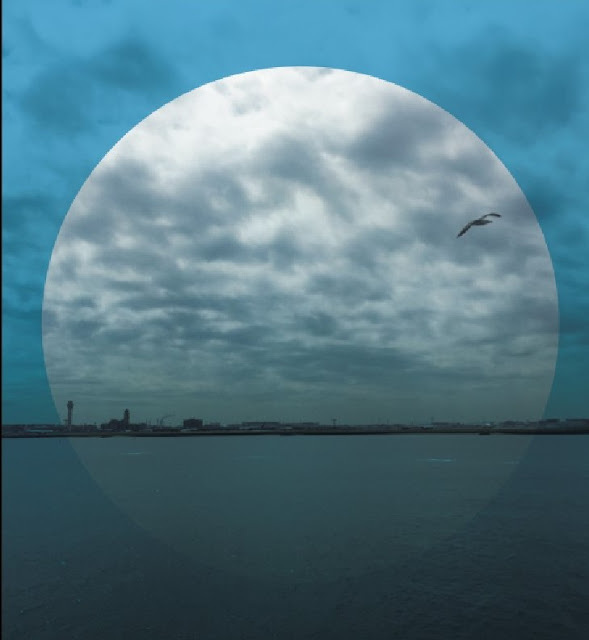 Recently, as members of Muzzix, they collaborated with another French collective called Dedalus to record Moondog (aka Louis Hardin): Round the World of Sound (New World Records), a work dedicated to the maverick composer. Sophie Agnel and Didier Lasserre have built a solid reputation within the French free improvisation scene. Agnel is a 2014-18 member of the Orchestre National de Jazz (ONJ) and can be heard on the critically-acclaimed Europa-Rome (ONJ Records), while Lasserre has recently been delving into the duo format with performance artist Ly Thanh Tién, trumpeter Jean-Luc Cappozzo from the Globe Unity Orchestra, or legendary guitarist Raymond Boni. Critics and fans alike hail pianist and composer Satoko Fujii as one of the most original voices in jazz today. In concert and on 80 albums as a leader or co-leader, she synthesizes jazz, contemporary classical, avant-rock and Japanese folk music into an innovative music instantly recognizable as hers alone. She has also established herself as one of the world's leading composers for large jazz ensembles, leading Cadence magazine to call her, "the Ellington of free jazz." Her ultimate goal: "I would love to make music that no one has heard before." 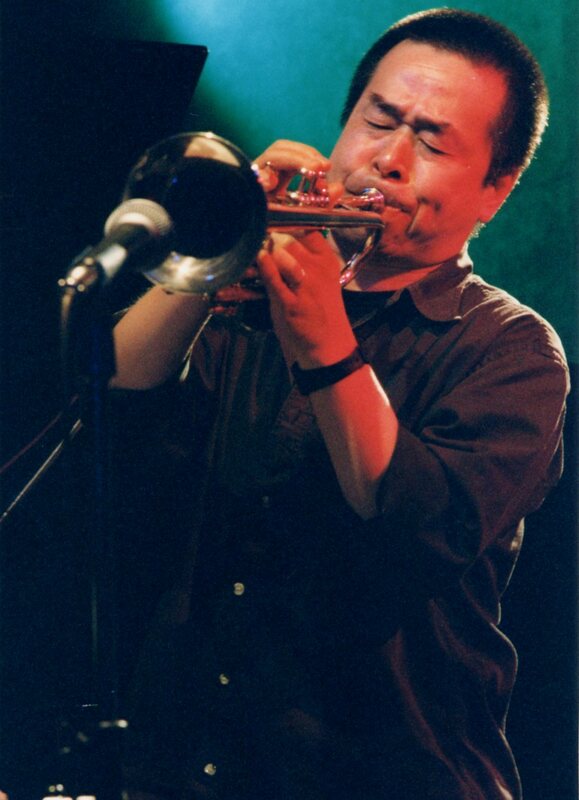 Trumpeter Natsuki Tamura is internationally recognized for his ability to blend a unique vocabulary of extended techniques with touching jazz lyricism. Since 2005, Tamura has focused on the intersection of European folk music and sound abstraction with Gato Libre, a group now featuring Tamura, Fujii on accordion and Yasuko Kaneko on trombone. In 2006 he co-founded the collaborative trio Junk Box with Fujii and drummer John Hollenbeck. 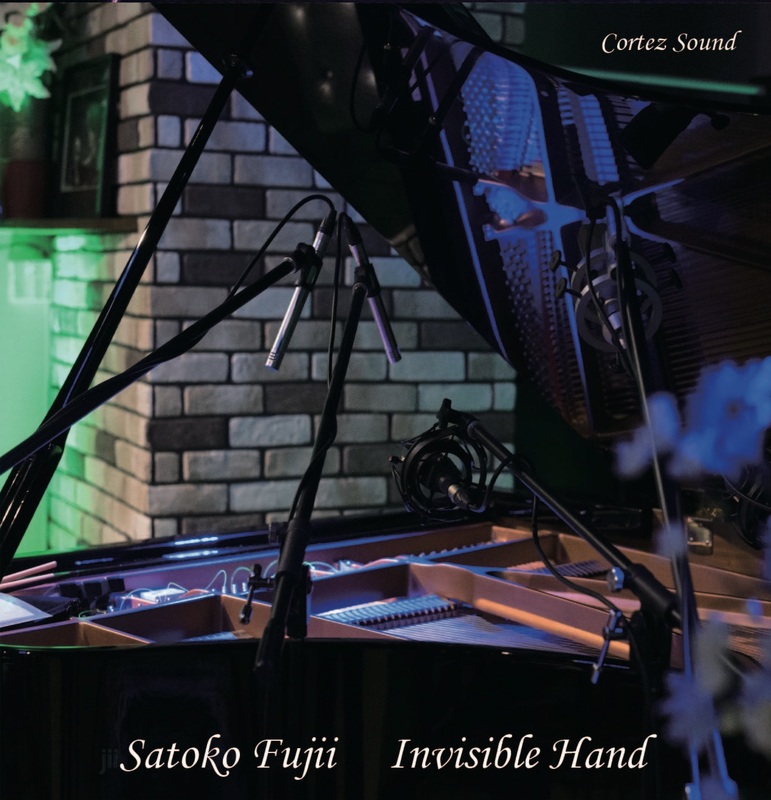 Pianist Satoko Fujii’s new double CD of unaccompanied piano music, Invisible Hand is an event. 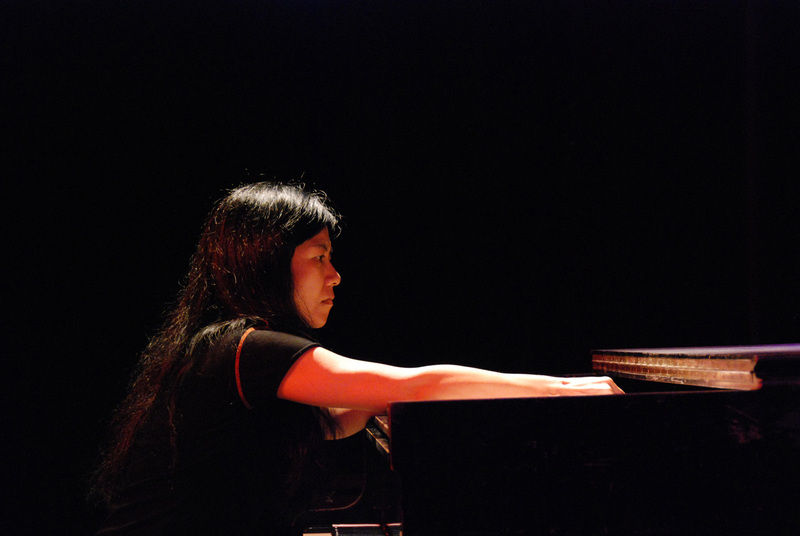 Although she is a prolific composer and bandleader, Fujii has rarely recorded as a soloist. In fact, after more than 25 years on the international jazz scene during which she has recorded 79 CDs as a leader, co-leader, or sideman, this is only her fourth solo album. 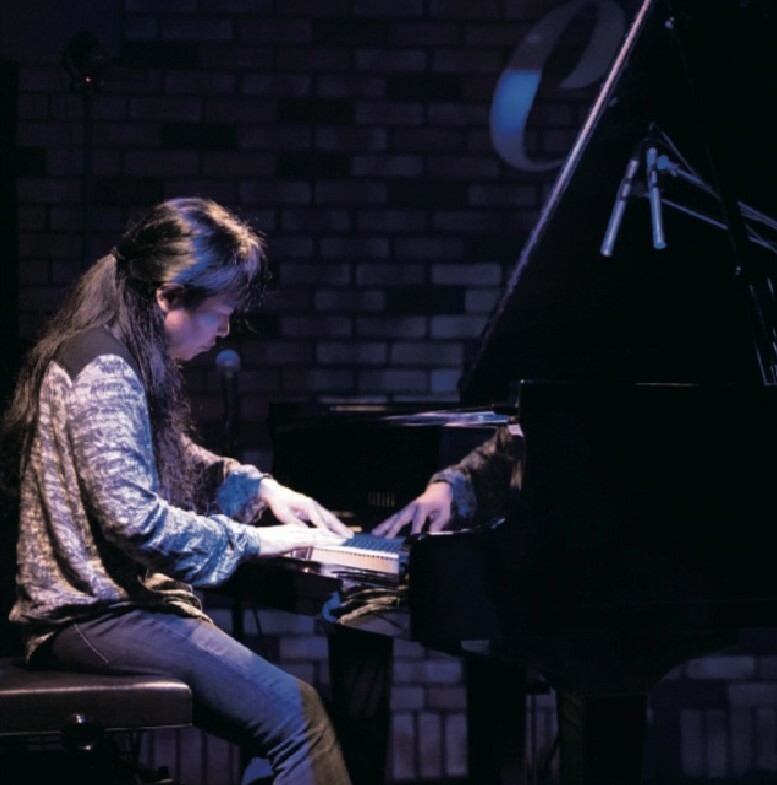 It all came about when Fujii received an unexpected invitation to play at the jazz club Cortez in Mito, a city about 120 miles northeast of Tokyo, which is not particularly well known for its jazz scene. Club owner Teruhiko Ito wanted to book her on the recommendation of a friend who had seen her perform with her Tobira quartet in Tokyo. Fujii first came with Kaze, the collective quartet of which she is a member, and the audience was so enthusiastic about the band that Ito invited her back to play solo. The warmth of her reception and the intimacy of the club inspired a stellar performance. Ito was so pleased by what he heard that he decided to inaugurate his own label, Cortez Sound, with the release of the date. 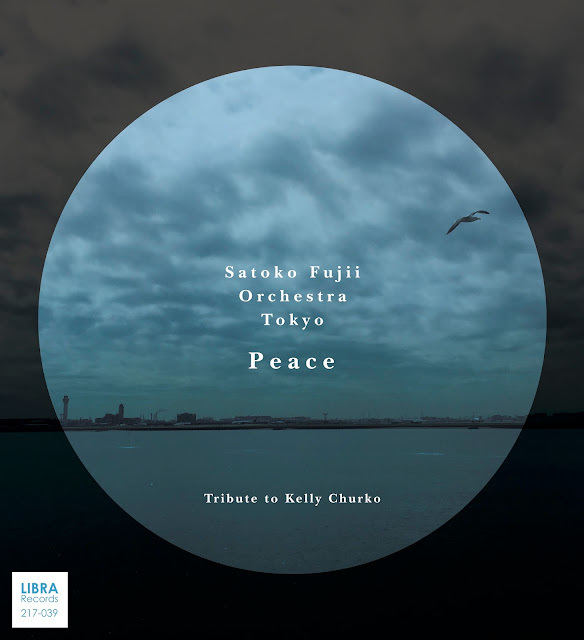 Unlike much of her often fiercely energetic large and small ensemble music, Fujii’s solos are generally quiet and spacious, lyrical, and introspective. “When I play solo, I have to go down into myself to hear my inner voice because there are no voices from other bandmates to interact with,” she says. 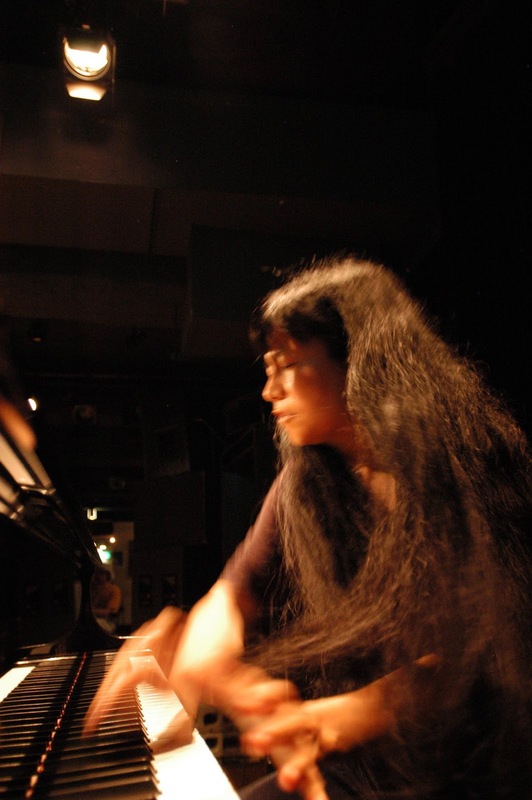 As followers of Fujii’s music might expect, her instincts as a composer help guide her improvisations, which develop organically with their own surprising logic and melodic coherence. “Thought” is a spare, lyrical improvisation composed of single note phrases and extended lines with only occasional left hand chord support. Fujii adds color and texture using dampened strings and the music slowly grows more rhapsodic before its recedes into silence. In contrast, “Increase” is built of short, nervous phrases that start and stop suddenly and lengthen into graceful, dissonant lines. Contrast between dense clusters of notes and untethered single note lines provide tension and release as the piece develops. “Hayese,” a Japanese word meaning “swift current” is an apt title for the rapid flow of ideas heard in the spontaneous creation. Second set improvisations include “Inori,” which begins with subdued playing inside the piano, evoking harp-like sonorities and abstract sounds that seem almost electronic. 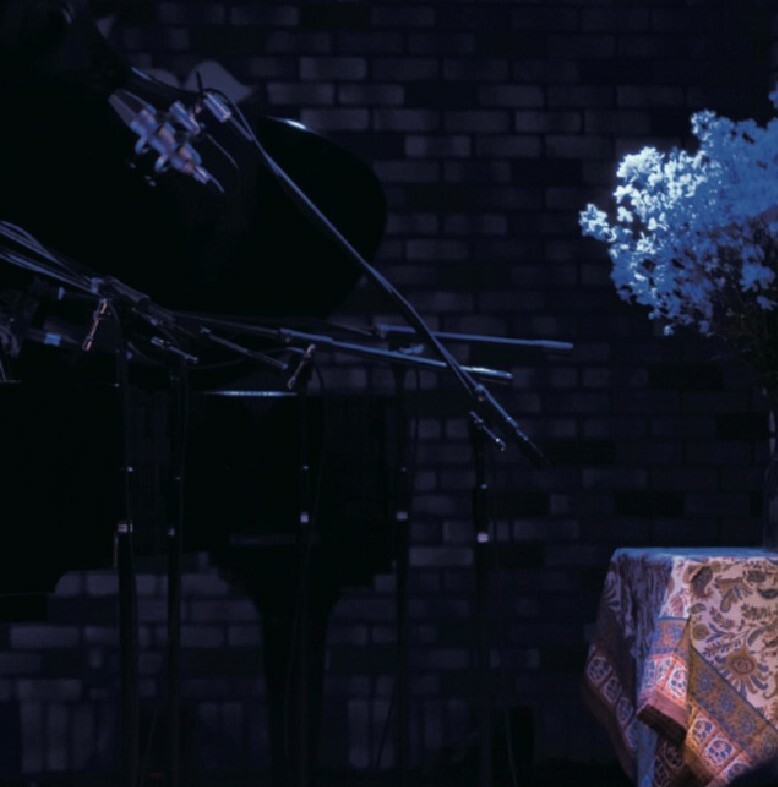 When Fujii switches to the keyboard, her heavily embellished melodies take on the characteristics of an “out there” Art Tatum. “Green Cab” is a tour de force of piano-wire improvisation with plinky-plunky textures and silky glissandos setting up a section of abstract boogie-woogie pianistics. The second set also includes one of her loveliest compositions, the gospel tinged “Gen Himmel” (the title track of her previous solo album), and the sweepingly narrative “Spring Storm,” the title track of the debut album by her New Trio. Critics and fans alike hail pianist and composer Satoko Fujii as one of the most original voices in jazz today. She’s “a virtuoso piano improviser, an original composer and a bandleader who gets the best collaborators to deliver," says John Fordham in The Guardian. In concert and on more than 85 albums as a leader or co-leader, she synthesizes jazz, contemporary classical, avant-rock and Japanese folk music into an innovative music instantly recognizable as hers alone. 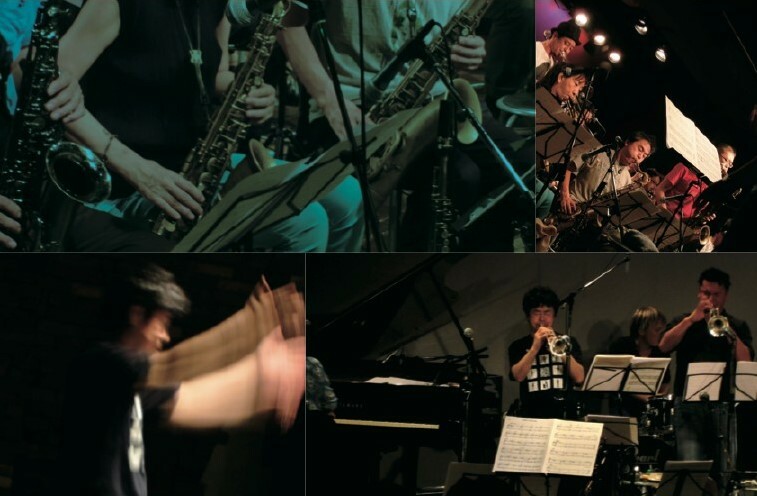 Over the years, Fujii has led some of the most consistently creative ensembles in modern improvised music, including The New Trio, Tobira, the ma-do quartet, the Min-Yoh Ensemble, and an electrifying avant-rock quartet featuring drummer Tatsuya Yoshida of The Ruins. She has also established herself as one of the world’s leading composers for large jazz ensembles, leading Cadence magazine to call her, “the Ellington of free jazz.” Her previous solo album, Gen Himmel (Libra) was praised by critic Francois Couture for “Strength, elegance, melodiousness that plays sharp contrasts with the atonal and angular aspects of her playing. 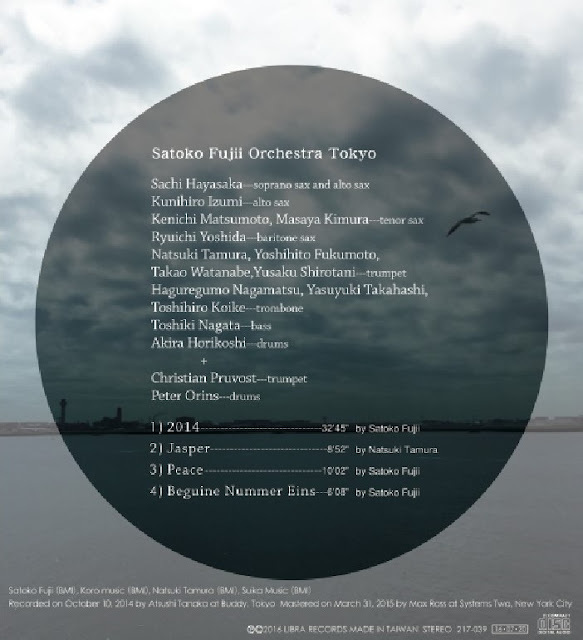 Over the years, Satoko Fujii has proved to be an exceptionally versatile, wide ranging, and often unpredictable composer, bandleader, and instrumentalist. Her solo playing highlights yet another side of her art, one that is introspective and melodic, but no less creative, surprising, and substantial. How long ago was it? When I performed at the Kunuttel House jazz club in Tokyo with my quartet Tobira, Mr. Yaguchi, who was in the audience, came up to me after the show and said, “Please perform at Cortez in Mito.” Mr. Yaguchi is a close friend of the Cortez club owner, Mr. Ito. This was a wonderful and surprising offer. In the e-mail correspondence that followed, I learned Cortez had an upright piano. Unfortunately, since I play inside the piano strings, I could not have a concert there. When I explained this Mr. Ito said, “We are planning to get a grand piano, so we will let you know when we have one.” I was so surprised that they actually emailed me back when they got a grand piano, and I was so happy that they remembered! That was perfect timing to perform with one of my projects, Kaze, which features Natsuki and two French musicians, Christian Pruvost and Peter Orins. The concert was set for January 2016. It was the first time I had visited Mito. On the day of the concert there was a snowstorm. I was amazed to see that people still came out to hear our music passionate music lovers, the enthusiastic club owner Mr. Ito, the manager Mr. Fujie, and their close friend Mr. Yaguchi were all waiting for us. Kaze is a band that uses a lot of noise which imposes a sense of tension in the audience. It was like a dream to see people embrace this kind of music in Mito, which is not a big city, and to find a venue that can offer music in these wonderful circumstances. After the concert, Mr. Ito and Mr. Yaguchi took us to a Japanese style bar close to the hotel. I learned that they had been listening to my CDs and that they sometimes came to my concerts in Tokyo. I play music that I like, and I was so encouraged to learn that there were people enjoying our music in the city of Mito, which I had just visited for the first time! On the way to the hotel, I received another offer from Mr. Ito, this time to perform a solo concert in April 2016. Playing solo is a little different from ensemble playing, because performing solo forces me to go deep into myself. The circumstances of Cortez and the enthusiasm there is reflected in the music. Supported by the audience, I was calm, facing myself, and breathing the air, picking notes one by one and weaving with them. The recording catches that irreplaceable time and meeting. Recently I have been hearing that people everywhere in the world are losing interest in music and culture, and the situation is getting worse and worse. However, around Cortez there are no signs of that. 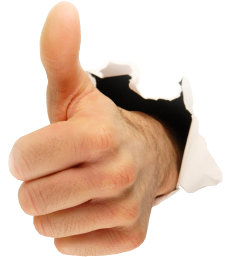 Instead, there is a strong, deep, and unequivocal enthusiasm for music. I played total improvisation in the first set, mixed with some written pieces in the second set. I would be very happy if you feel the music that breathes in the moment and expresses its life-size. 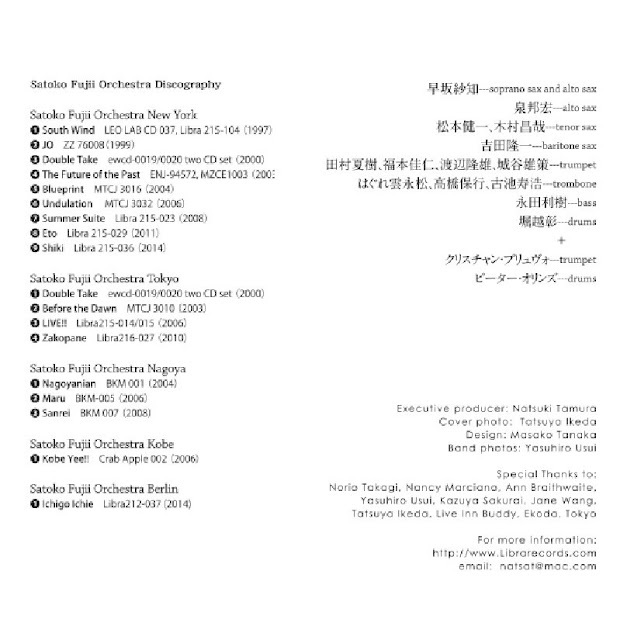 I sometimes don’t think I would know pianist Ms. Satoko Fujii if I didn’t work in this business. I remember her article in the magazine, “Out There” which I read a long time ago. I opened the café Cortez, where people can listen to jazz by playing analogue and CDs, and often chatted with visitors about jazz and audio systems. One day a local band asked if they could perform, and since then Cortez has been known as a live concert venue. Around one year later one of Cortez’s regulars, Mr. Yaguchi, asked me if I knew the piano player Ms. Satoko Fujii. I only knew her by name. We started talking about having her perform at Cortez. The music on her CD strongly touches my heart and the desire to host her in concert rose day by day. After acquiring a grand piano and expanding the venue, I could finally invite her to perform with the band Kaze. After the show, I decided I would like to hear her solo. I also dreamed of making a CD from the solo concert as the first Cortez CD. Surprisingly, she accepted my offer. Everyone at Cortez was excited by the project. We prepared the equipment, the venue, the photos, and all the other things that we could enthusiastically put together to support Ms. Fujii’s wonderful playing. Her solo piano playing and the acoustics of the venue blended perfectly, and this exquisite sound was recorded without losing any of its beauty. Please open your heart to the sound of the piano, which transcends the typical instrumental piano sound and is absorbed in the space. I think this recording will show the world Ms. Fujii's rare ability to draw deep beauty, emotion, illusion, reality and view of the world from a very deep place in the human soul with her incredible piano sound. As a person, Ms. Fujii possesses a gentle smile and friendly character that contrasts with her powerful persona in front of the piano. Now I’ve started traveling an endless trip with her. This recording has been completed with the help of many people including Ms. Fujii. Churko died of cancer in 2014, so the sprawling half-hour composition "2014" has a tie to the guitarist as well. Working on a large musical canvas, Fujii has plenty of space to explore different aspects of the orchestra, from extended melodies to massive orchestral chords to subtle orchestrations. 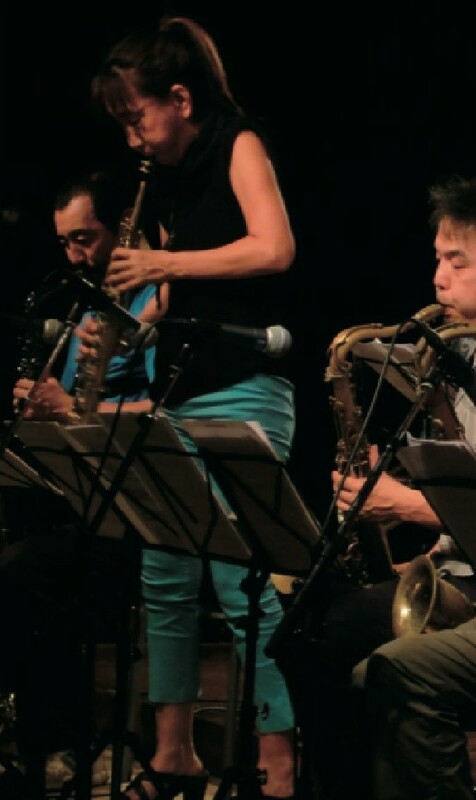 Fujii deploys duo and trio combinations of improvisers to enrich the written material. First up are the special guests Pruvost and Orins, followed by trombonist Yasuyuki Takahashi and tenor saxophonist Masaya Kimura. 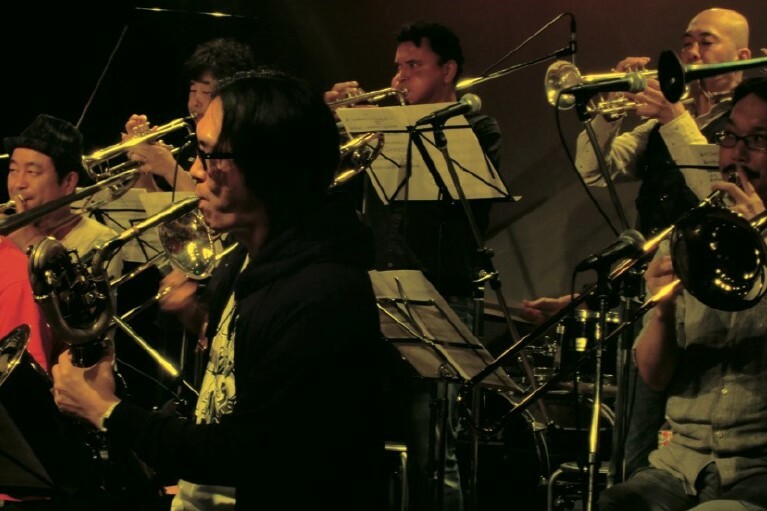 The energy level of the performance jumps suddenly as the drummers go at it together and then trumpeters Natuski Tamura and Toshihiro Koike chatter and soar before bright and bold full ensemble blasts. 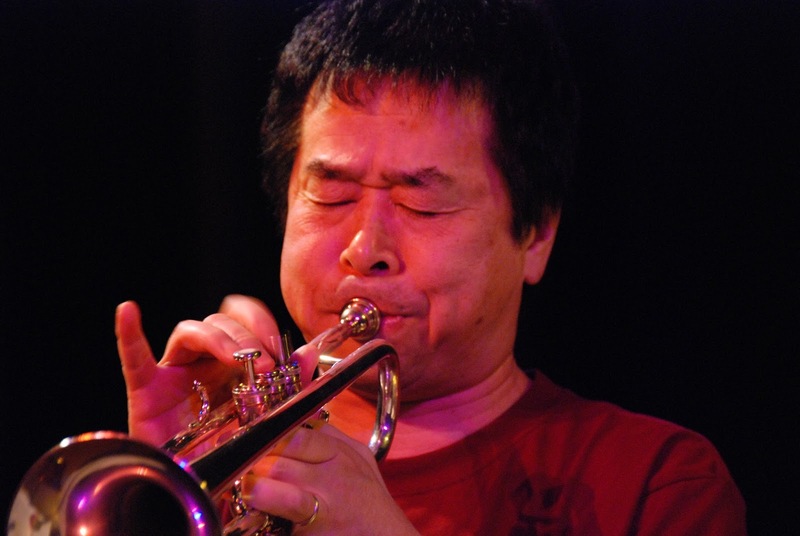 A trio improvisation with trumpeter Takao Watanabe, trombonist Haguregumo Nagamatsu and tenorist Kenichi Matsumoto unfolds over a funky beat before bassist Toshiki Nagata has the final say. Critics and fans alike hail pianist and composer Satoko Fujii as one of the most original voices in jazz today. She's "a virtuoso piano improviser, an original composer and a bandleader who gets the best collaborators to deliver," says John Fordham in The Guardian. In concert and on more than 80 albums as a leader or co-leader, she synthesizes jazz, contemporary classical, avant-rock and Japanese folk music into an innovative music instantly recognizable as hers alone. Her most recent group, Satoko Fujii Tobira with trumpeter Natsuki Tamura, bassist Todd Nicholson, and drummer Takashi Itani, released their debut recording Yamiyo Ni Karasu in 2015. 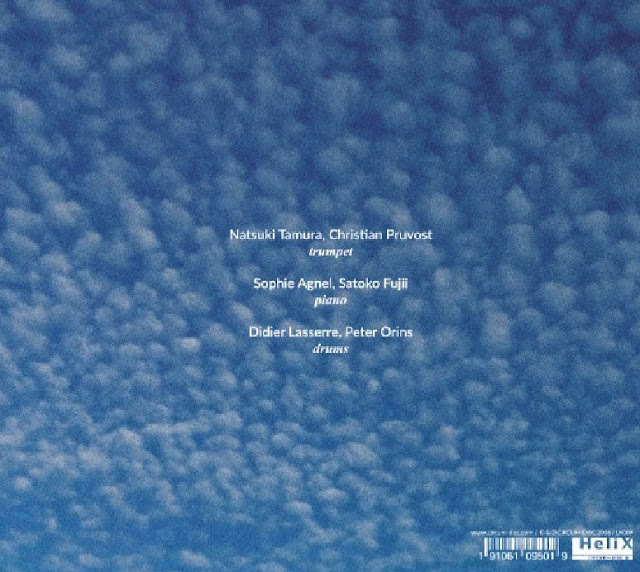 "There are pulse-pounding rhythms, vibrant tones and dark chords woven together into a multi-shaded tapestry of soundŠWhat an absolute pleasure to listen to Satoko Fujii." wrote Travis Rogers Jr. in The Jazz Owl. Over the years, Fujii has led some of the most consistently creative ensembles in modern improvised music, including the ma-do quartet, the Min-Yoh Ensemble, and an electrifying avant-rock quartet featuring drummer Tatsuya Yoshida of The Ruins. She has also established herself as one of the world's leading composers for large jazz ensembles, leading Cadence magazine to call her, "the Ellington of free jazz." Her ultimate goal: "I would love to make music that no one has heard before." Joe Fields, a driving force in the jazz music business for over 50 years, passed away on Wednesday, July 12, 2017. He was 88 years old. Joe was born in Jersey City, N.J. in 1929 and raised in Brooklyn. He attended Pershing Jr. HS and Erasmus Hall and was a citywide athlete, winning the prestigious New York Journal American Lou Gehrig award. Joe worked many jobs during his school years, including selling newspapers, pushing a rack in the Garment District, and driving a cab. He played college football at Syracuse and the University of Bridgeport where he was captain of his team his senior year. While attending Bridgeport, he met and married his wife of 66 years, Joan Nancy Boyd. After graduating from college, Joe had several business ventures but found his calling in the music business. In the late fifties, he began selling records to music stores in Brooklyn. 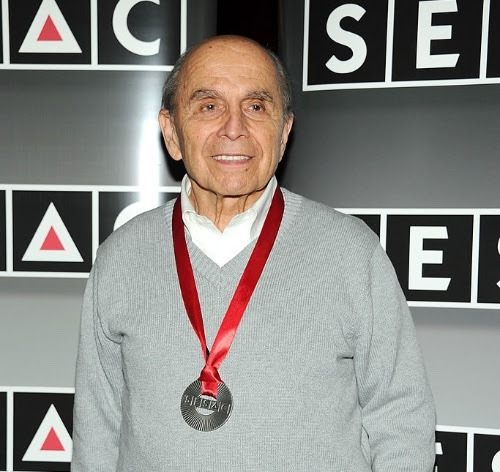 Joe was hired by London Records to pick singles for the United States market. He worked for MGM, Verve, Prestige, and Sue Records before becoming the national sales manager at Buddha Records. While at Buddha, Joe started their jazz division, Cobblestone Records. He started his own record label when he acquired Cobblestone from Buddha and renamed it Muse Records. From 1973 to 1996, Muse created nearly 30 years of successful jazz recordings featuring artists such as Pat Martino, Houston Person, Cedar Walton, Charlie Earland, Larry Coryell, Woody Shaw, and many others. The label was nominated for various jazz music awards and won two Grammys. During the mid 80’s Joe acquired both the Savoy and Landmark Records labels. Savoy was a seminal jazz company with recordings by Charlie Parker, Miles Davis, Dexter Gordon, and other influential stars of the early years of the Bebop era. In 1997, Joe, and his son Barney, launched HighNote and Savant Records. This started another legacy that continues to this day. Performers who have thrived on the label include such notable musicians as Kenny Burrell, Houston Person, Wallace Roney, Eric Alexander, Freddy Cole, Tom Harrell, Russell Malone, and others who continue to release new jazz recordings. Joe was a founding member of the Police Boys Club Lacrosse program in Manhasset, New York. He was one of the founders of the Manhasset Lacrosse “Day of Champions” where both college and high school teams continue to play in this yearly event. In recognition of his many contributions to lacrosse, Joe was one of the inaugural inductees in the Manhasset Lacrosse Hall of Fame. Joe joined the Manhasset Gentleman Joggers at its inception in the 1960’s, running in everything from Sunday jogs and 5K’s to half marathons. He enjoyed many years of friendly competition with a wide group of friends. He is survived by his wife, Joan Nancy Fields, four children; Christine Jenne (Richard), Suzanne Fields, Laura Tralongo, Barney Fields, grandchild Allison Passero (Julius), and a great grandson, Julius Passero III.